Welcome to Lead's Urban Legacy. 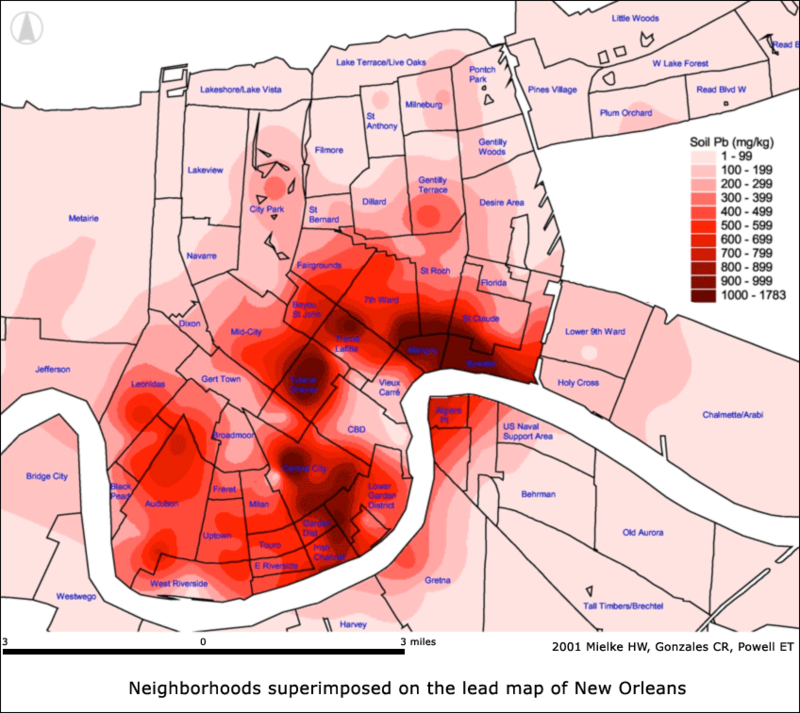 Much of our landscape, especially inner city areas, is contaminated with lead. Lead paint and dust in homes. Lead-contaminated soil in yards and playgrounds. Lead in children's bodies and bones. The major use of lead is in batteries which are recycled, however the urban legacy is the result of a century of adding millions of tons of the heavy metal to paint, gasoline and other everyday products that accumulate in the environment. Today, old paint, dust and soil, drinking water and even some health care supplies are the major sources of lead exposure. Warnings about lead paint abound. Lesser known and possibly more important, are the threats from lead-contaminated soil and dust in homes and yards (see link to Hidden Poison). Merely touching lead dust then licking or sucking fingers can raise the amount of lead in a child's body to dangerous levels. Too much lead in our bodies results in lead poisoning. This entirely preventable disease still presents a major health threat in the U.S. 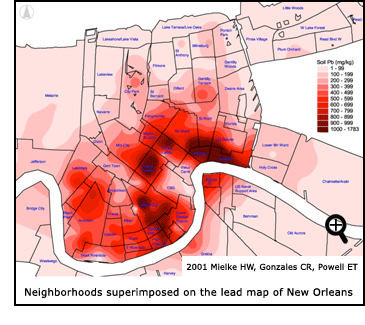 Even though children of all races and ethnic backgrounds are at risk, those most at risk are city dwellers, the poor and minority populations who live and work in the highest lead-contaminated environments. Unborn babies, infants and young children are especially vulnerable to lead. How can you protect yourself and those you love? The only way is to lower or avoid contact with the element. Learn where lead is found; have your water, soil and children's blood tested; and keep your house free of dust and peeling paint. Visit our Lead Protection and Help/More Info sections for guidance and counsel.